The first principle of intuitive eating (a strategy that utilizes your body’s inherent knowledge, genetic programming and instinct to help you manage your weight) is to Reject the Dieting Mentality. This oh-so-important step is where you decide here and now that you will never diet again. Never. Ever. Unfortunately, for many of us this could be the most challenging of all the Intuitive Eating principles. And why would we expect it to be easy? Over 100 million Americans are on a diet at any given moment. Little girls as young as 5 put themselves on diets, mimicking their mom and other female role models. Supermodels get thinner and thinner and airbrushing/photo-editing take more and more off of bodies in ads and other public images, slimming them into ideals that can only be obtained (theoretically) by dieting. We live in a superficial culture flooded by media messages intended to sell us products that promise us the moon and because we’ve believed for so long that there isn’t another option – we diet. We diet, depriving ourselves of all the foods we love until we can’t resist any more and we cave. We fall off our diet and eat all the foods we’ve restricted while dieting…which makes us feel guilty and ashamed – which either drives us right back into another diet or drives us to eat even MORE of all the foods we’ve been craving. 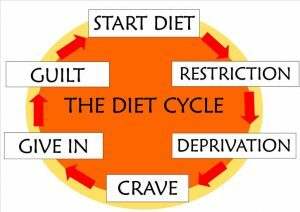 It is a vicious, vicious cycle that ends up making us fatter with each go around. Been there? So….how do you get off this crazy train? Decide not to ever diet again. Accept the fact that diets are futile. Rebel against the 61+ billion dollar diet industry that puts out diet after diet and diet product after diet product while never helping anybody lose weight and keep it off. Choose today not to play the game anymore. Look at your own history of dieting – are you any thinner now than when you went on your very first diet? Who do you know who has lost weight and kept it off for a significant amount of time without continuing to ride the diet roller coaster? Call up Jenny Craig or the Atkins people or Weight Watchers or any of your favorite weight loss companies and ask for them to send you statistics on how many of the people paying them their good hard-earned money ever actually lose weight and keep it off – but please don’t hold your breath for them to get back to you. And if your own diet experiences and the failures of all the “experts” aren’t enough to convince you that diets don’t work it’s hard to argue with researchers at UCLA who did a meta-analysis (a study of 31 other long-term studies) and found that the majority of dieters regained ALL weight lost and THEN SOME and that they would have been better off in the long run simply maintaining their heavier weight rather than dieting in the first place! Wouldn’t you be happier if you could manage your weight by eating what you wanted when you were hungry and stopping when you were full? Don’t you LOVE the idea of never counting another calorie, carb, fat gram or point? Imagine yourself NOT checking a nutrition label for once or choosing from a menu based on what you really felt like eating, not on what you think you are “supposed” to eat. Free yourself of the shame, guilt and obsession of dieting by vowing to never diet again – REJECT THE DIET MENTALITY!